Linthicum Heights, MD. – January 17, 2019 – TargetGov announces that its President & CEO, Gloria Larkin is presenting “Creating Your Most Powerful Tool: An Effective Capability Statement” at the 2019 National 8(a) Association Small Business Conference on February 11, 2019 from 1:00 pm – 3:00 pm CST at the Gaylord Opryland Hotel and Convention Center in Nashville, TN. 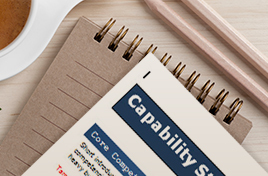 This session, “Creating Your Most Powerful Tool: An Effective Capability Statement” is designed to help attendees understand the three types of Capabilities Statements and learn how to create a powerful door opener Capability Statement document, your most important business development tool. TargetGov will also have an exhibit booth at the National 8(a) Association Small Business Conference. Come meet with Gloria and Cindy Gaddis, TargetGov’s Vice President, at booth 518. Both Cindy and Gloria have limited appointment times available for 1:1 meetings during the conference. To schedule an appointment click here. The National 8(a) Association 2019 Small Business Conference is the premier supplier diversity networking event for small businesses. This year the Conference will also be co-located with several other events including the TRI-Association Small Business Advisory Panel (TRIAD) Conference and the Department of Health and Human Services “Getting Back 2 Business” Procurement Event. TargetGov is celebrating its 22nd year as a nationally-recognized consulting firm. TargetGov provides expert consulting services and business development products that have directly resulted in clients winning billions of dollars in federal contracts. Our company is committed to helping all of its clients reach their contracting goals in the federal marketplace. In just the last five years, TargetGov’s proprietary FAST™ Process clients have won over $4 billion in federal contracts. Visit www.targetgov.com for additional information. Gloria Larkin, President, CEO and Founder of TargetGov, is a nationally-recognized government contracting marketing and business development expert. She has been interviewed on MSNBC, and quoted in the Wall Street Journal, Forbes, USA Today, INC Magazine, Entrepreneur Start-ups Magazine, and Government Executive magazine. Gloria Larkin serves as the Educational Foundation Chair Emeritus of the Board of Directors and is the past National Procurement Committee Co-Chair for Women Impacting Public Policy (WIPP), a non-partisan organization representing over 6,200,000 women nationwide. She is the author of the book, “The Basic Guide to Government Contracting” and “The Veterans Business Guide: How to Build a Successful Government Contracting Business” now in its fourth printing. She has received numerous accolades including: The U.S. Small Business Administration’s Women in Business Champion for Maryland 2010, Enterprising Women magazine’s 2010 Enterprising Women of the Year honoree, one of Maryland’s Top 100 Women in 2010, 2007 and 2004, and Maryland’s Top 100 Minority Business Enterprises in 2008 and 2006. Cindy Gaddis is the Vice President of TargetGov. An experienced executive with a demonstrated history of growing organizations in the information technology and services industry. Cindy has over 15 years of experience within the Federal market; from Business Development, Contracts, and Project Management. Cindy uses this knowledge and expertise, along with her master’s degree in Computer Information Systems, to ensure TargetGov clients’ success. She is a PMI.org certified Project Management Professional (PMP), and National Contract Managment Association (NCMA) member.